Dark Water is an account of an annual channel crossing from Oxnard, California to Scorpion Bay on Santa Cruz Island. This ancestral journey of Chumash descendants began in 2001 and spans approximately 20 miles from the mainland to the Island. This ambitious trek is a passionate effort of Chumash descendants to retrace, celebrate and preserve their culture and traditions. The tomol – or Chumash boat – is the center of this crossing. The tomol has been carefully hand-crafted to replicate the traditional tomol used hundreds of years ago by the Chumash people when thousands of them lived in villages on the Channel Islands and the mainland in southern California. The tomol is the oldest example of an ocean-going watercraft in North America. 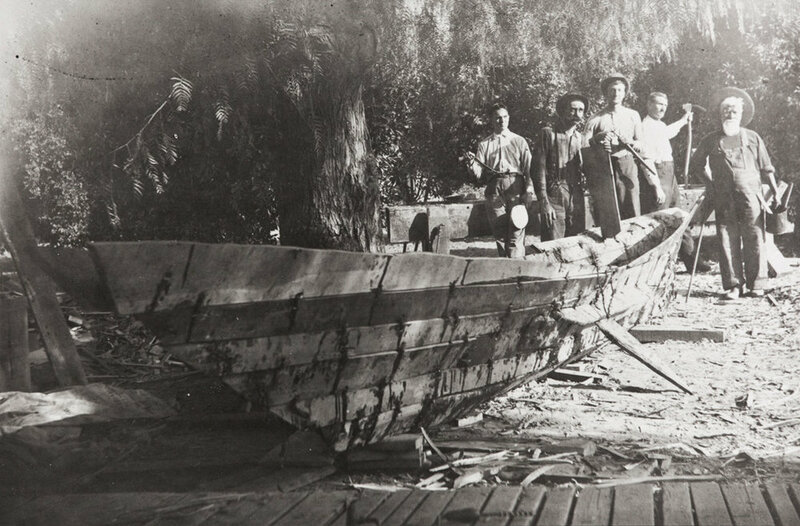 The construction of the tomol, believed to have been first built around 500 AD, was guided by plans passed down from Chumash ancestors when the tomols were last built in the 1850s. Redwood driftwood was made into planks that were fastened together with animal sinews and natural fibers and sealed with a black substance known as ‘yop.’ Yop was a combination of pine pitch and asphaltum – which, to this day, occurs naturally from oil seeping into the ocean from under the floor of the channel. 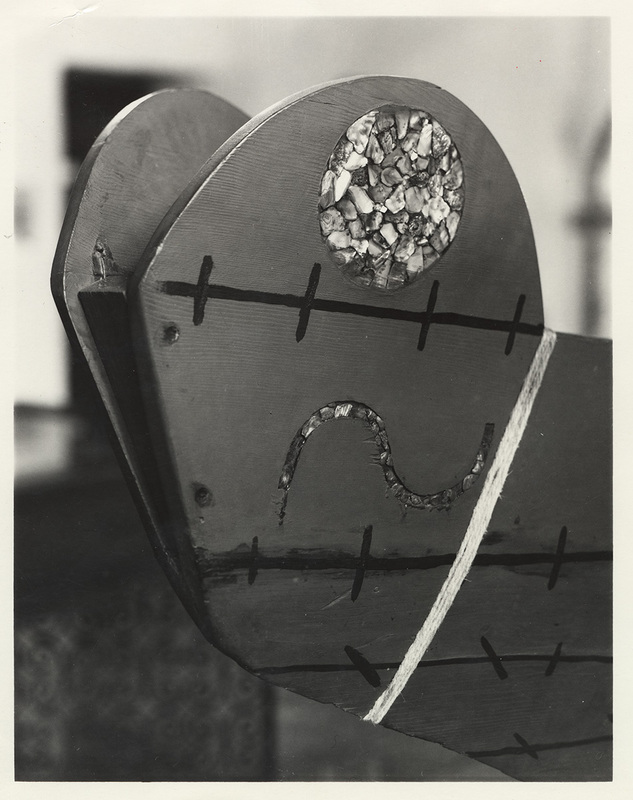 Tomols featured decorative inlayed images made with abalone mother of pearl. Tomols were used for fishing, travel between villages on the Channel Islands and between the islands and the mainland. Heavy, bulky items were brought to the islands including stone mortars and vessels, stone tool cores, bundles of milkweed fiber (used for binding, including stitching the tomol’s planks), seeds, acorns, deer, bows and arrows and large chunks of asphaltum. Items created on the islands and used for trade included finished products of baskets, products of stone or bone and otter pelts. Shell bead money was used as currency. Crossing the channel from the mainland to the Channel Islands is now a daily trip on large passenger boats in about two hour’s time. 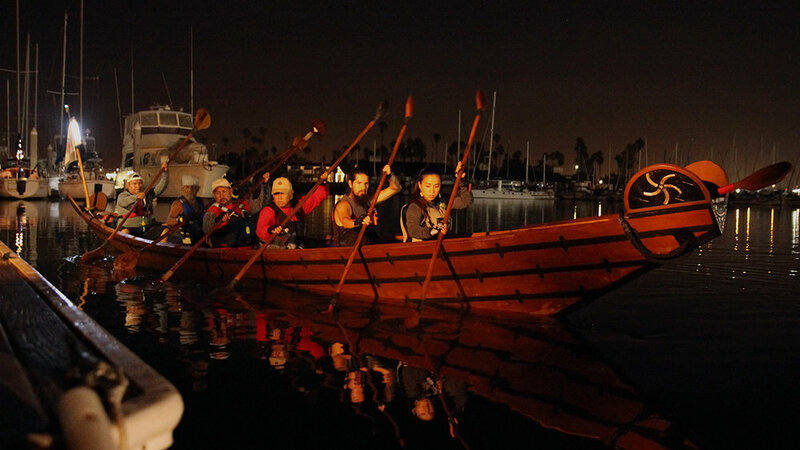 However crossing in a human paddled canoe shaped vessel is a nearly inconceivable feat. The channel holds many dangers for vessels due to wind, fog, swells and strong currents. However, the ocean is also the source of life itself for the Chumash people. The sea plays a dominant role in the maritime culture of the Chumash. The annual tomol crossing, which can take up to 13 hours, begins late at night. The paddlers are aware of all the challenging elements of the ocean but they also embrace, as did their ancestors, that the ocean is teaming with life – large and small. The sea provided sustenance, inspiration and life the The Chumash. It is common for paddlers to see or hear dolphin, large fish and even whales surfacing. Often the dark water glows with bioluminescent shimmering of living organisms in the water, giving a mystical yet reassuring comfort to the paddlers. The crossings are indeed a most spiritual time for Chumash descendants to re-connect and commune with their ancestors and find deep meaning in their rich history. Humans spend a great deal of time and energy trying to decipher the meaning of life and where they fit into the world. The tomol crossings have provided profoundly life-changing experiences and a meaningful way for Chumash descendants to go back to their roots and build community. The spirited gatherings on the beach of the site of what was once the largest Chumash Village on the island (Limuw) to meet the tomol are a testament to the spiritual and emotional rewards of celebrating their ancestors in a time where Native Americans struggle to preserve the fading traditions of their people.